This chapter explores the sacred tenet of Samoan faamatai leadership – O le ala i le pule o le tautua (the way to power is through serving) by emplacing pule (power) and tautua (serving) within a transnational framework – migration as development without return and as transnational expansion of leadership through “transnational reincorporation” (Levitt and de la Dehesa 2003: 588; Mahler 1998). In their leadership of their families and communities across the globe, transnational matai and their families have intensified travel, communications, repeat visits, and remittances to the homeland. This process creates economic, political, and social mechanisms that enable transnational Samoans to participate in Samoa’s development process over the long term and from afar (Mangnall 2004: 14). In doing so, it is argued that previous studies have mistakenly viewed transnational faamatai as necessarily detrimental to the Samoan culture and the nation-state of Samoa and have ignored transnational matai agency in developing Samoa through the large-scale flow of people, images, and cultural and economic forces across borders and back to the nation-state. Homeland individual/family decisions to migrate and global markets have induced transnational matai to blend strategies of migration and of capital accumulation, and these transnational subjects have come to symbolize both the fluidity of capital and the tension between national and personal identities. Transnationalism is the wave of future studies in population movement and mobility in the Pacific and offers a meeting point between a shrinking world, facilitated by infrastructures that enable space-time compression and an expansionist globalization (Lee and Francis 2009). 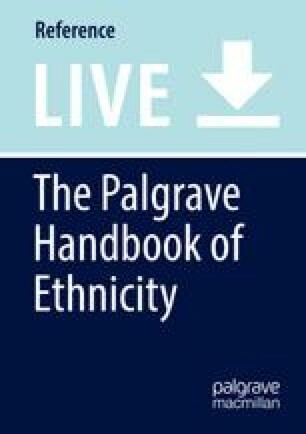 In this regard, the study of ethnicity is critical in delving deeper into people’s worldviews, perceptions of each other, relationships, and sense of identification to help us uncover some of the deeper perceptions and meanings of social change as seen and shared by cultural groups as they adapt to the fast-changing world. To better inform ourselves of the complexities of ethnicity and relationship to contemporary global developments and challenges, an approach which is people-centered, balanced, comprehensive, and research-based is timely. Migration and Transnationalism: Pacific Perspectives (Lee and Francis 2009) is the first edited volume to link a wider literature on transnational studies to specific cases in the Pacific and illustrates that rather than focusing on migration alone, Pacific transnationalism views migration in the broader context of indigenous movement and mobility. This perspective emphasizes kin-based agency in the negotiations and meanings and arrangements in diasporic settings. My work extends kin-based or aiga (family)-based agency to the focus on matai – family heads – as the leaders of aiga and their agency in which migration, remittances, and their experiences can now be viewed as extensions of local faamatai traditions as much as they are a result of the incorporation of Pacific communities into a global economy. That is, we can now view the home society and host society as a part of a single social field with families through the faamatai using indigenous conceptions of appropriate behavior to mediate new situations (ibid. ; Small 1997: 193). As Nahkid states “Pacific transnationalism is a way of life.” (2009: 215). However, while there are other features of transnationalism, we cannot understate the value of remittances. Our interest in, attention to, and sustainability of remittances based on why billions of dollars are remitted to Samoa on an annual basis and why transnationals and their family leaders persist in maintaining a set of multi-related social relations that bind them and connect them and link their countries of origin with their countries of transnational settlement (Schiller et al. 1995), is crucial in understanding how and why Pacific transnationalism is indeed a way of life. The “myth of return” (Walton-Roberts 2004: 80. 92) provides the affective tie when transnationals balance the desire to return with the reality of settled life and fuels transnationals, especially matai to meet their cultural roles and responsibilities as aiga heads and leaders to meet social, cultural, and financial obligations in the homeland. The relationship between transnationalism and development – and how best to study it – is emerging as a major international policy concern. Recently, transnational theory and research has stressed that the networks of socioeconomic relations of individuals and groups which embrace migrants’ country of origin and destination are of paramount importance in the study of migration and return (Mangnall 2004; Byron and Condon 1996: 102; Nyberg-Sorensen et al. 2002: 18; Transrede 2001: 5). These studies also suggest that “people connected by transnational networks” is the most important resource for developing countries (Mangnall 2004: 8; Nyberg-Sorensen et al. 2002: 24). Mangnall states that the advantage of transnationalism as a framework is that it recognizes that “neither return nor integration is the whole story for the study of international migration and development” (ibid.). Rather than doing one or the other, many migrants prefer to develop transnational lifestyles “between” or “across” two countries, economies, cultures, and lifestyles (Transrede 2002). International migration has been shown to be a similarly “highly diverse and flexible phenomenon,” with outcomes ranging from permanent settlement abroad to sporadic or regular returns to home for longer or shorter periods to permanent return (Gustafson 2001: 374 cited in Mangnall 2004: 9). So transnationalism is ideally suited to the study of faamatai, and transnational matai as heads of the corporations of kin, and their impact on development processes. Mobility is at the heart of transnationalism literature. High rates of return and repeat visiting are considered a hallmark of mature transnational communities (Bedford 1997; Bertram and Watters 1985; Faist 2000: 13). Despite this, the scale and nature of the different types of transnational mobility remain largely unexamined, along with the importance of their contribution to transnational ties, identities, and development compared with other exchanges such as phone calls, goods, and remittances. Faist’s (1997) framework for such research is based on two premises. Firstly, international migration and return cannot be adequately described by focusing solely on countries of origin and destination. Instead, they must be studied as unfolding in “transnational spaces” within which flows of people, goods, capital, and services cut across the borders of nation-states (ibid:206). Secondly, return must be regarded as a factor of the strength of social ties and social capital within transnational spaces, as well as a strategy for social capital’s transfer. The skills, knowledge, and contacts gained in the process of forming and expanding these social ties can be used to transfer human, financial, cultural, and other kinds of capital and, in the process, develop transnational identities and loyalties (Mangnall 2004: 8; Ammassari and Black 2001: 30; Faist 1997: 204, 2000; Levitt 2001: 202–203). The creation and maintenance of these transnational ties and identities depends upon the interaction of physical and metaphoric return. Metaphoric return – or the “myth of return” – is the talking and thinking about return to their country of origin undertaken by those transnational migrants who decide to settle in the host country. At a personal level, the act of migrants talking and thinking about return can “create stable moorings” by bringing past and present, home and host countries, closer together. Metaphoric return can also lead to physical returns – resettlement and visiting (Mangnall 2004: 9). It also plays an important role in encouraging activities which keep ties to the homeland – teaching children their culture and language, joining cultural groups, remitting money and goods, exchanging letters and phone calls, fund-raising for home village development projects, and taking on matai titles and leadership roles in the host community. These activities of “tautua” reinforce the transnational ties of reciprocity and loyalty or affective ties which are essential for return visits on a wide scale. In the transnational view migration, host settlement and repeat homeland visits have two main development impacts. First it has created a “continuous socio-economic field” (Mangnall 2004: 22) flowing between Samoan communities in modern nation-states, the “traditional” families, villages, and bureaucratic sector in Samoa, and ultimately capitalist metropoles. Within this transnational field, the benefits of migration are evidenced by the circulation of people, remittances, and goods within the aiga and faamatai networks. My Marsden research project “Samoan transnational matai: ancestor god ‘avatars’ or merely title-holders?” is a longitudinal project which examines intergenerational experiences of transnational faamatai across three nodes of meta-Samoa (Australia, Hawaii, San Diego). Findings reveal that key indicators of the stability of this socioeconomic field are the four directional flows of remittances as tautua: cash to families and villages; cash to families, villages, and Samoa through saofai (matai installations); cash to Samoa via tourist dollars; and cash to families and villages and Samoa via family reunions and funerals. These four cash flows are evidenced by high levels of repeat visits to Samoa, including malaga-transnational funding for community projects (Lilomaiava-Doktor 2004; Franco 1991) and au-malaga (visiting families as tourist visits). Secondly, migration has led to an increase in the total Samoa population within that transnational field documented as approximately 200,000 in Samoa and a conservative 420,000 in the western metropoles of New Zealand, Australia, and the United States alone. 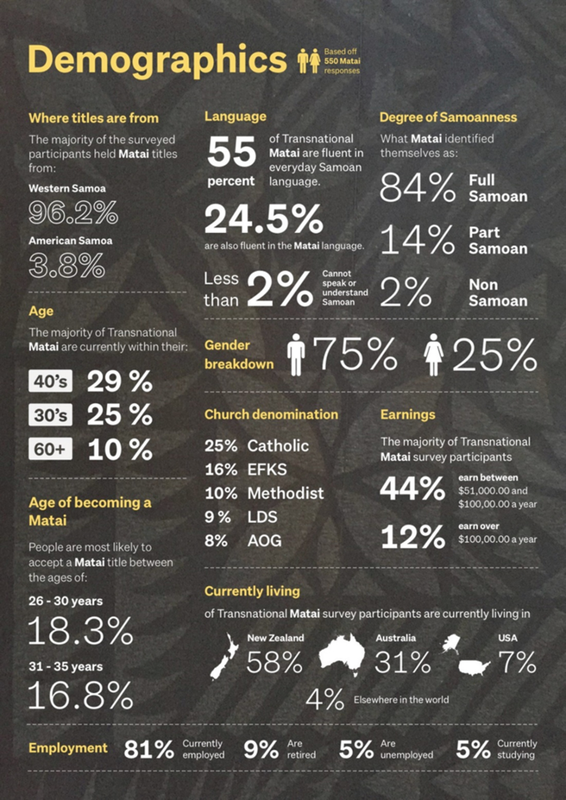 Considering the fact that over a half of all Samoans now live overseas, the faamatai has clearly become transnational in scope. Governments of Pacific nations now recognize the influence that globalization is now having on their countries. Since 1970s they have been influenced by a set of economic drivers known as economic rationalism or neoliberalism. Leading known players influencing government policies such as the International Monetary Fund (IMF), the World Bank, and the Asian Development Bank (ADB), and blatant increasing role of China in the Pacific, all ascribe to this theory (Gough 2006: 83). How then have Samoans risen to this challenge? Through faamatai, Samoan individuals and families have responded strategically to both the challenges and opportunities impacting on them. Samoans are recognized for their adaptation to new circumstances, for striving to take from the new what suits them without relinquishing what is of great importance. They have demonstrated a tireless ability to survive through great change, such as the three Cs – colonialism, Christianity, and capitalism (Macpherson and Macpherson (2009). Their response to the current globalization era is no different: they have carved out their market niche and adjusted to new circumstances. They are part of a group of new transnational Pacific communities that are experiencing migration as a process of empowerment, a process referred to as “globalization from below” (Kennedy and Roudomet of 2003:6 cited in Gough 2006: 83). Gough (2006: 84) refers to the period 1850s to 1914 – the opening up of Samoa by whalers, the first missionaries, foreign shipping companies, and “commercialism” – as the “first period of globalization” as Samoa’s economy commenced integration into the global economy. This period of the three Cs was articulated by Samoans as occasions of “opposition” (Anae 2002: 163). Such occasions have fueled an enduring and persistent Samoan identity both in Samoa and among its transnational communities (Anae 1998). It is this enduring sense of Samoanness and adhesion to the ancient centrality of the well-being of the family through faamatai that has sustained Samoa and Samoans through many eras of transformation, including finding their niche in a neoliberal globalized world. Today, Samoa is a nation governed by matai – titled family heads. The role and responsibilities of the matai in Samoa is to ensure the well-being of his/her family both domiciled in the village and in transnational spaces. The role and responsibilities of transnational matai domiciled out of Samoa is the well-being of both his/her family in the host country and the family in Samoa as well as other transnational spaces. In 2016, 70,000 registered matai and 146,481 matai titles accounted for 37% of the population in Samoa (Meleisea 2016). Only matai can be elected to Parliament, and a universal suffrage introduced in 1991 to replace the former electoral system that had restricted the right to vote to matai only has enabled all Samoans aged 21 and over the right to vote in elections. Prior to 1991, a crisis arose in Samoa precisely because only matai could vote or hold elected office. In order to increase the numbers of their voters, senior chiefs began to split lower matai titles among several holders or created new titles. This inflationary practice became so common that Samoans referred derisively to these new voters as matai palota (ballot chiefs) (Chappell 1999: 287). This reform movement drew criticism from some scholars. Meleisea states that “Western notions of individual rights and freedoms have been promoted by mass education and emigration” (Meleisea and Schoeffel 1983: 111). The matai system, including splitting titles and creating new ones, had been exported overseas in diaspora to New Zealand, Australia, and the United States. Western-educated Samoans are earning better incomes, acquire palota titles, and enter politics. “The foremost source of change in Samoa today is from New Zealand,” Meleseia says. “There is hardly a family in Samoa without relatives here, and there are few Samoans in New Zealand who do not maintain a relationship with their homeland” (Meleisea 1992: 63–64). It is a well-known fact that Samoans in New Zealand are the powerhouse of faamatai in Samoa and in transnational spaces (see Demographics chart where of 550 responses, 58% matai survey responses came from New Zealand compared to 31% from Australia and 7% from the United States). Kane (1995) also states that economic indicators of remittance/cash flows are mainly coming from New Zealand. An examination of the 41 books of the Matai registers held in the Samoa Land and Titles Court in 2016 revealed that there was a total of 70,000 registered matai (Meleisea 2016) and 146,481 registered titles (Potogi 2016: 126). On further examination of the matai registers in September 2018, I can now reveal that of the 70,000 registered matai, 2083 of them were born out of Samoa (born i fafo). This number is a very conservative number which does not take account of all registered matai born in Samoa and domiciled i fafo given that the Samoan population in Samoa is approximately 200,000, while the Samoan population overseas numbers approximately 420,000. Of the registered matai born i fafo, 83.5% were born in New Zealand, 6.6% born in Australia, 6.3% born in the United States, and 3.6% born elsewhere in the world. Add to this NZ-born cohort – the 50% Samoan-born transnational matai domiciled in New Zealand respondents from the transnational matai survey – the math produces some strong trends. While we cannot be certain that these samples are representative of the entire population of Samoan matai, these results suggest that a very substantial proportion of transnational Samoan matai live in New Zealand (of the 420,000 Samoans who live outside of Samoa, over a quarter of them live in New Zealand); the Samoan population in New Zealand according to the 2013 census was 144,138, with projected population as 160,000 in 2018 (see Tables 1 and 2). Such concerns are echoed by others. The Macphersons (2009) in their sociological study of the impact of globalization on a Samoan village presaged the role of globalizing forces on the shift from chiefly and religious authority to a questioning democracy in Samoa when they wrote that migration has created new, dispersed multi-nodal forms of the Samoan family and village that have become more dispersed and more complex than ever before and that the capacity of traditional faamatai in Samoa to manage change in religious and secular spheres is being challenged by transnational faamatai “because the criteria for membership in these elites have shifted over time, membership of family and village elites is no longer homogeneous as it once was” (p. 191) (Table 2). Findings from my Marsden project (Anae et al. 2017) and Gough (2006, 2009) provide an important counterclaim to this assertion: a counterclaim which marks these shifts among transnational faamatai as Samoa’s comparative advantage in a globalizing world. These shifts are occurring on the edges, Samoa i fafo (Lilomaiava-Doktor 2004). After all, Samoa cultural evolution is not merely a growth in complexity. It will involve stronger political controls, more exploitative relationships, more violence, more conflict, more risk taking, and greater general insecurity as transnational matai negotiate the edges of the transnational spaces. At the same time though, we observed the growth of skills of transnational Samoan skills in all fields – sports, academia, the arts, music, politics, and in the arts of poetry and filmmaking. Transnational matai, especially in New Zealand, are playing a prominent part in promoting their comparative advantage in a globalizing world, the precursor of high space-age progress (Anae 2006). In this context, transnational Samoan matai must create challenges in the religious and secular spheres and not accept meekly the increased pressure of adhering to arbitrary authority. At the same time though, this comparative advantage is driven by their commitment to achieve peace and harmony, not only for their families in transnational spaces but also for a transnational tenet of faamatai expressed by research participants as “to be lima malosi and loto alofa” (to have strong hands and a loving heart) which delineate the effective and affective ties to being a matai and the faamatai practised in transnational spaces (Anae et al. 2016). In these illustrative injunctions, we see the emergence and resurgence of a moral and ancient ethical code – o le ala I le pule o le tautua. This research shows that major cultural fundamental changes resulting from the impact of globalization are still anchored in the intensification of traditional widespread Samoan faamatai practices, which enables transnational matai to develop Samoa from afar. Based on ethnographic data from my Marsden Research Project (Anae et al. 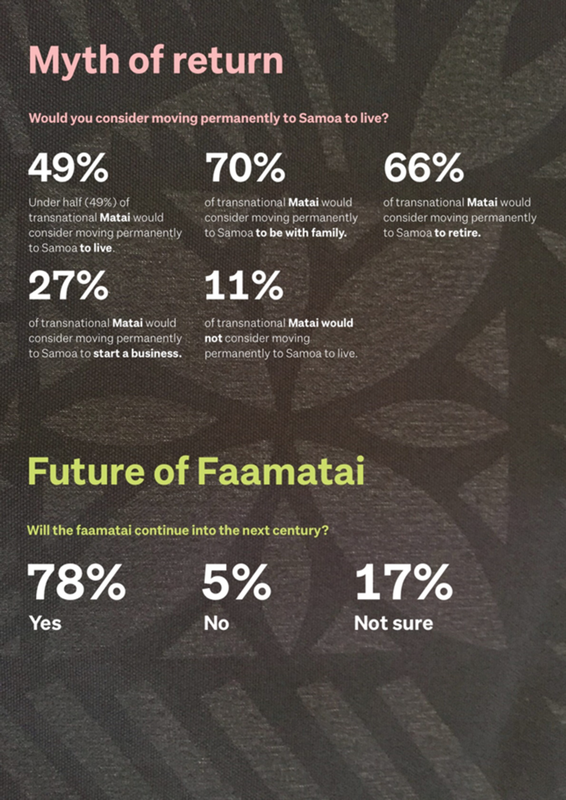 2017) and findings based on a survey of faamatai experiences completed by 550 transnational matai, the sacred tenet of Samoan faamatai leadership – O le ala i le pule o le tautua – will now be discussed. Transnational faamatai experiences/meanings and attitudes are important indicators of the sustainability of faamatai and faasamoa (Samoan culture) in transnational spaces and ultimately in Samoa and should be acknowledged. The literal translation of o le ala i le pule o le tautua is “the way to power is through service.” Pule infers secular authority and economic strength (malosi) and is the effective tie; tautua is to serve with reverence and dignity (mamalu) and is the affective tie. The title only has meaning if the family is together…otherwise it’s an empty symbol. 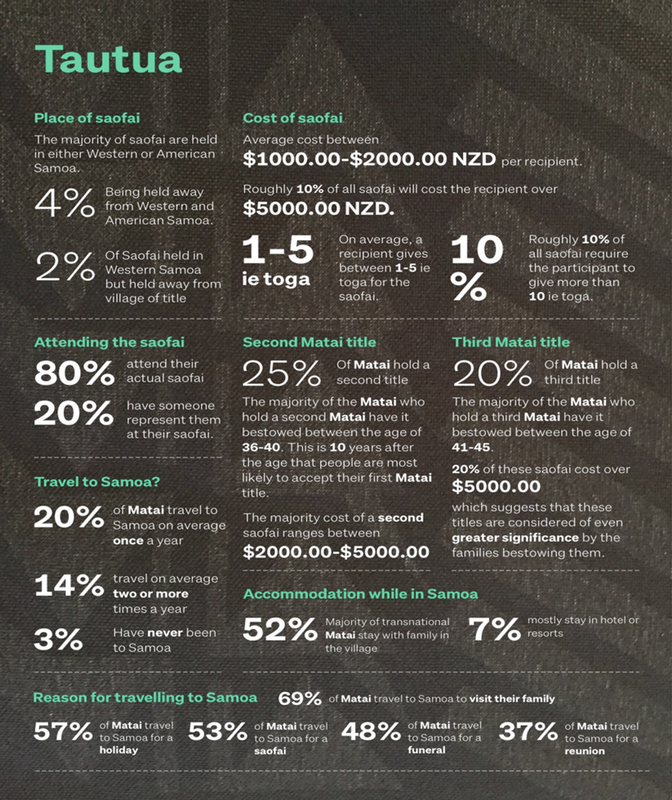 A strong theme emanating from the data is that of “the reluctant matai.” Most matai preferred to stay at the back “cooking the pig” – the work of untitled men of the village – rather than take on a matai title. Many hesitated and procrastinated about this important decision before deciding to take on matai titles. Almost all matai participants recalled this “reluctancy” but still decided to accept the call from aiga in Samoa. 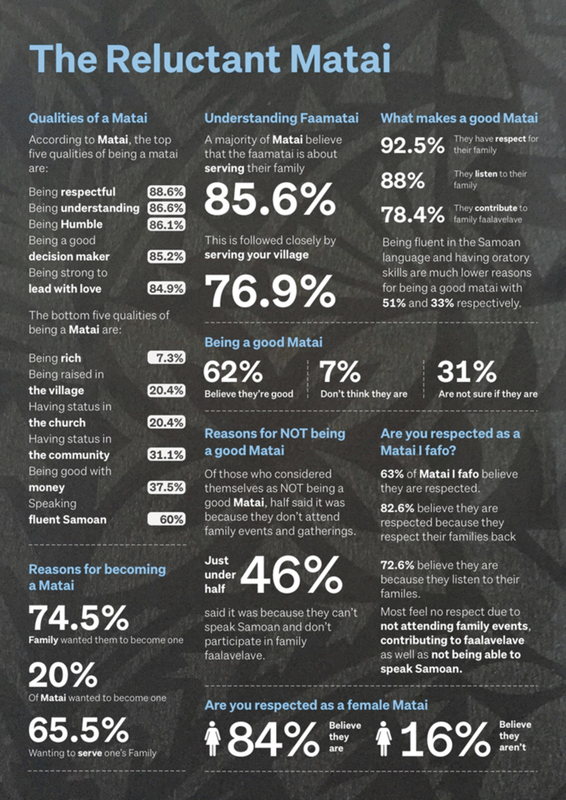 Reasons for accepting their matai titles varied, but all participants had a strong sense of their service to the village, family, church, and the Samoan community where they lived and in Samoa. Many expressed that their reason for accepting titles was for love of mother or father. Other common reasons for accepting were because the title acknowledged their service and support for faasamoa, to honor a parent’s wish to take on a title, and to help their family. Some saw being a matai as exciting, a blessing from God, or a chance to use leadership skills from careers in the military or public service. Many resisted initially but changed their minds because of family wishes, the death of a parent, or the need to help in a family emergency like the 2009 tsunami. Growing up, all the men knew about faasamoa and faamatai, was the work - the umu (oven), killing the pig, and other feau (work). For most, their first real education was serving a matai, usually their father. Service was “being a good son,” learning by watching and doing rather than talking. The women usually learned from a parent, especially if their mother was a matai, but also from taking on leadership in their communities overseas, especially teaching the Samoan language and customs. Being a good matai was seen as “taking care of your family so they’re happy” rather than exercising power. For another “the power of the matai [is to] develop your family.” It was also important for matai overseas to tautua mamao (provide service from afar) to be “loved” when they return to Samoa. A transnational matai also needed to understand and combine faasamoa and democracy. The women also stressed the need to understand “path of the matai” – having the right attitude, ethics, language, and respect. Tautua or service was seen as the most important requirement of a transnational matai. One young matai described it as the “best part” of Samoan culture. A pioneer matai agreed but lamented that “money carries more weight” than actual physical service. For the pioneer generation, tautua embraced a range of community and church activities – organizing flag days and other anniversary celebrations; setting up cultural and language programs, radio and TV programs; hosting official delegations from Samoa; and raising help for villages. For the younger matai, showing respect for elders was important. Those born overseas tended to focus their tautua around the church. Their lack of confidence with the language and lack of extended family nearby were cited as reasons for them being less involved as matai at family occasions. As a result, young Samoans overseas felt “being a matai brings hardship.” Many were turning their backs on faasamoa and faamatai because these were perceived as being just about faalavelave and giving money. A trend identified by some participants was for transnational matai and women matai to be given alii (sacred chief) titles rather than tulafale (orator chief) or speaking titles. It was seen as further constraining young matai whose “faasamoa is weak” from taking part in discussions and decisions. Some female matai suggested it reflected views that women needed to be protected from potential political conflicts as tulafale or that the faamatai was the domain of men. For countries overseas there are no villages, so the church is the village. The women matai expressed strong views about difficulties being recognized as “real” matai. They themselves believed their titles reflected “ability” and “because the elders have faith in me.” The main obstacles were from male matai who were “ignorant” about why female matai existed and from those who did not believe female matai should exist at all. Living overseas had provided ways to challenge such attitudes that would perhaps be unavailable in Samoa. In Hawaii, for example, a female matai used her Samoan radio program to challenge a male matai who had told a female tulafale she could not speak at a wedding. Fiti-Sinclair et al. report the presence of cultural obstacles to women’s political participation in villages (Meleisea et al. 2015). This found that although most villages in Samoa do not formally or overtly discriminate against women matai, there are barriers of Samoan “custom and usage” to women’s participation in village government. Few women matai sit in the village council (fono), but those who do so have a better chance to make themselves known as decision-makers in the community. In some villages there is an unspoken convention that male matai are the decision-makers, so women who want to take a public role in politics (compared to advising their menfolk privately) need to be quite courageous in taking their places and speaking in the councils (ibid. : 48). Some also referred to the importance of holding a title of high rank and seniority as a consideration for a person aspiring to become an MP. This is because a senior, high-ranking title carries more prestige than a more minor matai title and can be more influential, they said. The issue of seniority was alluded to by one of the candidates, who said that while she attended the village council, she did not speak, in deference to a senior holder of the same title as her own who had that prerogative. These cultural considerations are very important in the Samoan system of politics and governance. The women matai participant narratives argue that being overseas has opened up new opportunities for women matai not available in Samoa. For women matai in Sydney, Hawaii, and San Diego, one of these opportunities is the overt exertion of her pule (secular authority), malosi (economic strength), mana (spiritual power), and mamalu (reverence, dignity, and social power) in the absence of a traditional “village” and thus male-dominated village councils and suffocation of the dominance of churches and faifeau (Anae et al. 2016). In essence the transnational space away from Samoa provides the opportunity for the revitalizing of Samoan women matai as leaders of Samoan transnational communities (Anae 2017). A unique development of the faamatai in Hawaii is the Atoalii, formed in the early years of Samoan settlement there and whose members act in similar ways to village matai in Samoa. Initially the council was instrumental in organizing faalavelave, annual flag days, hosting visiting Samoan groups, and working with social agencies to help with Samoan youth. But the Atoalii’s prominence has faded in later years amid disagreements over the acceptance of government money to run flag days and the Atoalii bestowing some matai titles on members. The best way forward agreed by all participants was to teach younger generations born overseas about Samoan aganuu (customs) and language and, especially, the faamatai – to “implement the power of the matai, that’s the power of the matai [to] develop your family.” The need to teach Samoan language from preschool age to university level was stressed by several matai, as was the need for parents to “force” their children to speak Samoan. This a very salient observation given that the Samoan observer has been documenting crucial attacks on the faamatai in Samoa propelled by global pressures, sociopolitical upheavals through legislation, the Lands and Titles Court, and research directly impacting sa’o (paramount chiefs), monotaga (contributions to village of title), tautua, and Samoan custom. In 2015, the customary institution of matai sa’o was investigated by enquiries by the government of Samoa through its Law Reform Commission into the viability of the status of matai sa’o. Traditionally a matai sa’o was the sole head of an extended family owning common property, possessing authority over its members including holders of other matai titles belonging to that family. Meleisea suggests that the government’s interest is very likely to be related to legislation passed subsequent to the Land Titles Registration Act 2008, such as the Customary Land Advisory Commission Act (CLACA) 2013, which makes it easier for customary lands to be leased (Meleisea 2017). This legislation suggests that a matai sa’o may authorize a lease on a portion of customary land appurtenant to his/her title on behalf of the extended family. This complicates the current situation whereby multiple holders of senior titles that have the status of matai sa’o are living in the village to which the title is associated, or in other places in Samoa, or in transnational spaces, and the issues in defining Samoan custom (ibid.). Transnational matai experiences of faamatai, development, and the transnational framework are particularly useful as it allows for an integrated analysis of the relationship between social and symbolic ties, physical, metaphoric return, and repeat returns and the transfer of people, goods, and money between transnational corporations of kin, matai, and Samoa. The transnational framework (Faist 1997, 2000 cited in Mangnall 2004) proposes that a migrant’s choices of physical or metaphoric return – whether to stay, return, or visit – are conditioned by their symbolic and social ties to host and origin countries. At the same time, those transnational and local social ties can be used to transfer human, financial, cultural, and other kinds of capital to the origin country through physical and metaphoric and real return via repeat visits. All the key elements for the transnational framework – physical and metaphoric return, social and symbolic ties, various kinds of capital – are to be found in the participant narratives and survey responses presented above. They describe many kinds of physical return between Samoa and their host societies, including sporadic and regular visits, and more importantly reasons why the faamatai and matai identity is important to them. As leaders of families in the transnational space, this makes them doubly responsible for personal as well as familial tautua to their families in Samoa and across the globe. Their leadership roles are more significant among women matai. The narratives describe metaphoric return activities designed to keep ties to the homeland and maintain Samoan culture and identity through education programs, language preschools, church services, community groups, phone calls, and letters. Local and transnational social ties are forged by matai participants including spouses, children and grandchildren, individuals, and groups in the community such as churches, social, and sports groups. Samoans and matai across the diaspora still express their migration in terms of tautua – an obligation to aiga – everywhere. Aiga encapsulates migrant identity and facilitates a wide range of overt functions, such as raising money, providing housing and employment, coping with life crises, and giving its members the security of living in a traditional, secure, well-loved group (Pitt and Macpherson 1974). Gough makes the point that not only is commitment to the traditional institution of aiga one of the major motivations behind migration but also that its replication across the diaspora is also one of the key reasons Samoans have been able to establish such successful diasporic communities and, ultimately, why these communities flourish. Samoans both personally and as part of a kin group led by their matai represent Samoa’s comparative advantage; Samoans engaged successfully in the world economy in unique ways while retaining faithful links to traditional practices. Cultural practices based in a tradition have provided the framework for their engagement, enabling the comparative advantage that Samoa needs in order to ensure a sustainable future in a globalizing world. Gough points out that Samoa’s engagement in the globalized world, no matter how seemingly successful to date, is not without risks. Continued engagement is dependent on market opportunities and favorable migration policies of labor-importing countries; moreover the lives of transnational Samoans are now entrenched in the diaspora (2006: 91). Globally, they are considered “labor migrants,” and the remittances they send home form part of the estimated $65 billion per annum that is returned to labor-exporting economies (Kane 1995). In the case of Samoa, between 30% and 50% of the GDP of the country, more than all the exports and aid, is remitted each year. Opportunities to participate in the global labor market have boosted per capita GNP and, as a result, assisted development in Samoa. Community services and opportunities, like access to health services and education, have broadened significantly. There are costs however, like changing consumption patterns. When people favor imported food over local produce, this threatens to undermine local market opportunities. Moreover there are “long-term social and cultural implications” which need to be balanced against the benefits. There is also a strong argument too that emigration hinders development because of brain drain and skill export (Ahlburg and Levin 1990 cited in Connell 2003). There are pressing issues concerned with modernity on Samoan society, such as social disturbances, alcoholism, physical/sexual abuse, rise in crime, “unrest” among the youth, and suicide. In their effort to negotiate the global economy through aiga links and transnational corporations of kin, Samoans have created a meta-Samoa with links across a well-established diaspora. Their competitive edge is founded on three key aspects of Samoan life: firstly, the acculturation of mobility; secondly, the remaining true to one of the key tenets of faasamoa, the welfare of the collective (Gough 2006:39); and thirdly, a leadership/faamatai, which intent is on attaining and maintaining peace and harmony for aiga and for Samoa. By participating in Samoan life across the diaspora, Samoans reinforce their relationships and fulfill their obligations and commitment to extended family and village. At the same time that they are becoming socioeconomically and politically successful in their countries of birth – the western metropoles – they are reproducing the social relations that ensure the reproduction of faasamoa. By doing this, they are demonstrating their comparative advantage in a neoliberal world. Of course there are limitations. A strong remittance economy is a fragile economic MIRAB strategy (Bertram and Watters 1985) which depends on positive market forces and friendly migration policies and relies on an ongoing ability to balance the dialectical relationship between western acculturation aspects of the individualism associated with participating in a neo-liberalized world and the collectivism of the faasamoa. But more importantly the most crucial limitation is that diasporic Samoans are severely constricted in their practice of the faasamoa in terms of deep interaction with the homeland. Their faasinonomaga (identity) has been compromised by their contexts and for some may only exist in remittances to Samoa. Nevertheless they still see themselves as “Samoan” and identify strongly with the faasamoa, thus creating transnational nodes of this meta-Samoa. However, homeland Samoans may not see them as such. Despite diasporic remittances and the tourism dollar being a large part of Samoa’s economic albeit fragile sustainability, “real” Samoans for them will always be those who are born in Samoa and who are rooted in their faasinomaga and who are physically “seen” to be serving their aiga, villages, and country in Samoa. Thus it depends on the ability of the Samoan diaspora to face these challenges with strategic foresight. By emplacing pule and tautua within a transnational framework, migration as development with repeat returns and as transnational expansion of leadership through “transnational reincorporation” economic, political, and social mechanisms has been created which enables transnational matai to participate in Samoa’s development process over the long term and from afar. Transnational faamatai experiences/meanings and attitudes encapsulated in the research findings and data are important indicators of the sustainability of faamatai and faasamoa in transnational spaces and ultimately in Samoa and should be acknowledged. Having no control of erosion some say corruption of faamatai customary practices happening in Samoa, transnational matai are nevertheless continuing to value and act on their tautua to their diasporic Samoan communities, their families, and Samoa through their loto alofa ma lima malosi affective ties. Affective ties are much more than merely emotional ties. They are ties which produce effective action through remittances of comprehensive cash flows which are driving Samoa’s development. Aiga cash remittances, “tourist” dollars and visits, saofai contributions, aiga reunion, and funeral contributions are providing the bulk of Samoa’s development capital. Despite complaints of transnational Samoans and matai reading articles in Samoa Observer about challenges to faamatai from the Government and Land and Titles Court in Samoa, very few transnational matai have totally departed from its practices. It is an integral part of their lives despite its alleged faults and ambiguities, and Samoa’s sustainable future depends on it.